Search Engine Optimization (SEO) is the process of preparing your website to meet and exceed the guidelines of the major Search Engines (Google & Bing). At YourSocialStrategy.com we prepare your site by first starting with a Website Audit to determine a score (out of 100) and to learn what areas of your website need attention. Prefer to Email Us? Click Here! Measurement – Through Monthly Reports, you will see your results quickly! Do you have any questions about Search Engine Optimization? Please view our Frequently Asked Questions about Search Engine Optimization (SEO) or feel free to contact our team. When setting up a new customer with our SEO Packages, there is a lot of work that needs to be completed initially. To provide further information on what we do, please check out our SEO Setup page. Just because you have a website for your business, doesn’t mean people can find it. Your website could be holding you back! 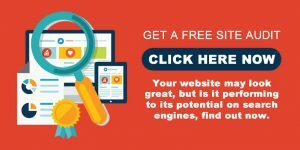 Simply fill out the form to the left for your FREE website audit and we’ll identify immediate SEO opportunities and devise a clear plan of action to help you excel online.